Should You Weigh Your RV? The simple answer to the question, Should you weigh your RV, would be a big YES. The primary reason for doing this is to make sure that you do not exceed any of the manufacturer’s load ratings for either the RV or the tow vehicle or anything that you are towing behind your RV. Rvs and tow vehicles are different from the cars that we use to drive around town and go back and forth to work. Because we have the ability to load things in the open spaces of Rvs it is much easier to overload those vehicles. Overloading is not a good thing! One of the major mistakes that a newbie to the RV life makes is to not pay attention to weights before they make a purchase. In the case of towing a trailer, many people do not know the ability of their tow vehicle and the sells people are for the most part not forth coming with the proper information. This can cause you to end up with a trailer that your tow vehicle can not pull safely. It is very important to know the weights. You need to know the terminology of weights to understand what to look for. So here are the main ones. GVWR - The Gross Vehicle Weigh Rating. This is the maximum weight that the vehicle can have. This includes passengers, cargo, fuel and the tongue or pin weigh of any towed vehicle. GAWR - This is the Gross Axle Weight Rating. The maximum weight that the axle assembly is designed to carry as measured at the wheel. GCWR - This is Gross Combined Weigh Rating. This is the maximum weight for the combined weights of the tow vehicle and the vehicle that is being towed. Your tow vehicle manufacturer will list a GCWR. Tongue Weight - The downward weight exerted at the hitch or the 5th wheel connection by a fully loaded towed vehicle. UVW - Unload Vehicle Weight. The weight of the vehicle as built at the factory with full fuel, engine oil and coolants, but without cargo, fresh water, LP gas, occupants or dealer-installed accessories. SWCR - Sleeping Weight Capacity Rating. The manufacturer’s designated number of sleeping positions multiplied by 154 pounds (70 kilograms) for each. Note: If your passengers weigh more than 154 pounds each, the number of passengers may have to be reduced to avoid exceeding SCWR. CCC - Cargo Carrying Capacity. The GVWR minus all of the following: UVW, full fresh (drinking) water weight (including heater), full LP gas weight, SCWR, tongue weight of any towed vehicle and weight of any dealer-installed accessories. Tire Ratings- the MAXIMUM LOAD that a tire may carry is engraved on the sidewall, along with a corresponding COLD inflation pressure. A reduction in inflation pressure requires a reduction in load rating. Tire manufacturers publish charts that establish the load capacity at various inflation pressures. That all looks good but where do you find the weights that match the above terms? There are data plates for every vehicle that you purchase. These data plates will have the weights stamped on them for your reference. On tow vehicles, these data plates are most often on the inside driver door frame. For your trailers, these data plates will usually be on the outside driver side of the trailer and sometimes inside the trailer in one of the cabinets. Tire ratings are marked on the sidewall of your tires. This might be one of the most overlooked ratings when it comes to weighing your vehicle. Each tire has a maximum cold tire inflation pressure that will determine the maximum load that that tire can support. There will actually be two ratings on the tires. One will be for the tire being used as a single tire on one end of the axle and the other will be for when the tires are mounted as dual tires on the end of an axle. Pay attention to these weights! If you exceed these weights, you can have a premature tire failure. These weights are on all tires of every vehicle that you are using. There are two ways to weigh your rig. One is to use a commercial certified scale that you can find at truck stops, feed stores, grain elevators or co-ops. The other is by individual tire position using scales made for that purpose. 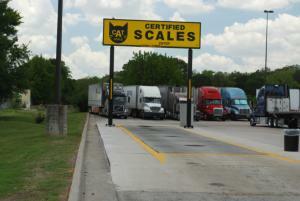 With most certified truck scales, you can only weigh by axle position. If this is the only thing you have available, it will at least tell you if you are within the maximum weights for each axle, GVW and GCVW. It might be possible in some instances to use a truck scale for individual tire position but it would be difficult. According to the Recreational Vehicle Safety and Education Foundation, the best and most accurate way to weigh your rig is by individual tire position. The main reason for doing this is that it is possible to have an axle that does not exceed the GAWR but one end (individual tire rating) can be over weight. This goes back to that sometimes overlooked rating of maximum tire rating. Because of the way that Rvs can be loaded, it is very possible that there will be more weight on one side of the RV than on the other. The same can be said of the tow vehicle. If you had too much for lunch at the truck stop, then your side of the truck might exceed the side where your lovely wife is sitting. If you weigh by tire position and one end of the axle exceeds the maximum tire rating, then you should redistribute the load to bring it back into range. Safety is the primary reason for making sure that your rig is within all of the manufacturer’s specifications. Your tow vehicle has a max tow rating. Exceeding that can cause problems when it comes time to stop the rig. Exceeding a tire rating can cause a blowout which can be a real problem. Too much weight on the tongue or pin of a 5th wheel can cause the front of your tow vehicle to not have adequate weight on the tires. This will decrease your ability to control the vehicle. This may seem like a difficult task to get all of these weights, but it isn’t. There are folks and organizations like the Recreational Vehicle Safety & Education Foundation that provide a service to weigh by tire position. There are lots of truck scales available when you travel. I for one, use the truck stops while I’m traveling. After I fill up with diesel, I will go over to the scales and weight the rig. The scales are segmented so you get each axle weighed separately. At that time, the rig is as heavy as it should ever be, since we are loaded for the trip. We have all fluids, all passengers including the dog and cat. It can’t get any easier than that! If you find an axle is overloaded, then you will have to find a way to move some of your load from front to back or back to front as the case may be. One of the easiest ways to reduce your load is in the fluids that you carry. Water weighs about 8.3 lbs per gallon, propane is about 4.5 lbs per gallon, and diesel is about 6.6 lbs per gallon. So if you put 100 gallons of water in the fresh water tank, you’re looking at 830 lbs of weight. Don’t forget that your water heater holds 8 to 12 gallons depending on your rig. Drain the water heater if it is a concern. Don’t forget that if you are traveling and didn’t dump your tanks, you are carrying a lot of dead weight. Know your weights and stay within them. Happy camping!